Maybe the saying is true: you don’t know what you had until it is gone. For the families in this episode, the absence of public health laboratories turned their worlds upside down and negatively impacted both the present and future. These families represent us all and highlight the vulnerabilities that would exist if there were no public health laboratories working continuously to keep our communities and populations safe. This is the second episode in the series produced by members of the Emerging Leader Program cohort 10. You can listen to our show via the player embedded below or on iTunes, Stitcher or wherever you get your podcasts. Please be sure to subscribe to Lab Culture so you never miss an episode. Special thanks to Jim Hermanson at the Wisconsin State Laboratory of Hygiene for his help in recording this episode. The post Lab Culture Ep. 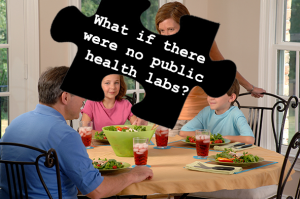 11: What if there were no public health labs? 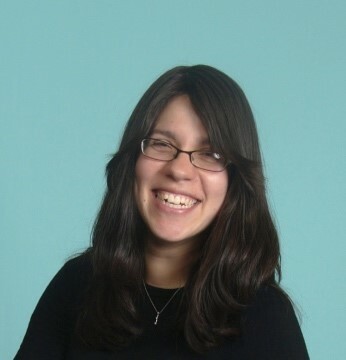 appeared first on APHL Lab Blog. This post was originally written for From The Lab Bench on October 2, 2014. The world is not as large as it often seems, and there are countless reminders that diseases are willing travelers. As US health officials saw Ebola ravage populations in West Africa, it became clear that we needed to prepare just in case this devastating disease arrived here. To much of the public health community in the US, the question of Ebola arriving wasn’t a matter “if” but rather “when.” And when it arrived, a coordinated response would be critical to rapid and thorough containment. The first step was to ensure we were able to detect Ebola in suspect cases. In August, FDA issued an emergency use authorization (EUA) for an Ebola detection test developed by scientists at the Department of Defense (DoD) United States Army Research Institute of Infectious Disease (USAMRIID). Once the EUA was issued, CDC quickly began working with certain state and local public health laboratories, all members of the Laboratory Response Network (LRN), to determine which were best equipped to perform this testing. Select laboratories were approached by CDC to receive the test kit (Initial deployment of the test was limited to 12 LRN member laboratories but CDC continues to expand the number of qualified labs. ); the Laboratory Services Section of the Texas Department State Health Services (the state public health lab) was an obvious choice given its stellar record in biothreat testing. Dr. Grace Kubin, director of the state public health lab, explained that they had the necessary instrumentation, four highly skilled biothreat staff well versed in handling select agents and a biothreat laboratory located in a separate building from the rest of the laboratory to ensure proper containment of threat agents. 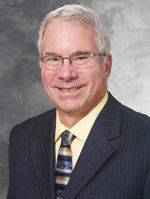 Once the Commissioner of the Texas Department of State Health Services, Dr. David Lakey, gave his approval, the laboratory immediately began preparing. The first step was to inform all of the staff at the state laboratory. “I wanted them to hear it from me first, not the media,” said Dr. Kubin. She reviewed the extensive safety precautions that would be taken to ensure everyone’s safety. From there, she worked closely with her team to establish step-by-step guidelines for handling of an Ebola specimen from receipt to distribution of test results. Laboratory staff would work with state epidemiologists who would serve as the initial contact for suspect cases. 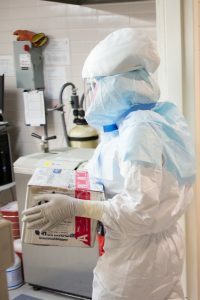 Staff in the shipping office would be alerted when potential Ebola specimens were expected; just as with all biothreat specimens, they were not to open the package but instead contact biothreat lab staff to come pick it up. None of this was atypical for this laboratory, though. Its biothreat team works routinely with far more dangerous select agents such as ricin and anthrax. This is what they do and they do it safely. Everything was already in place for their routine work; the possibility of Ebola meant tightening existing systems and keeping fear at bay. At the end of August they determined they were ready to test for Ebola. Just over a month later, on Sunday, September 28, Dr. Kubin started receiving emails concerning a possible Ebola case in Dallas; later that evening CDC approved the Texas state public health lab to begin testing. On Monday the specimens were shipped to the state lab and to CDC for simultaneous testing. Early Tuesday morning the specimen arrived at the lab where staff were waiting to receive it. This was their first specimen. Just as instructed, the shipping staff alerted the biothreat laboratory staff of the package’s arrival without opening it. Testing began right away. By early afternoon the biothreat lab staff obtained a presumptive positive result for Ebola. CDC laboratory staff, working simultaneously and performing additional testing, confirmed that finding shortly after. Lab staff devoted the rest of the day to distributing information to Commissioner Lakey, the hospital staff, CDC and other key parties. Though the patient was already in treatment and under isolation, staff knew other potential cases could surface as the contact investigation progressed so they were poised to receive specimens any time of the day or night. “They’re used to getting calls at three AM saying there is a specimen that needs immediate testing,” explained Dr. Kubin. 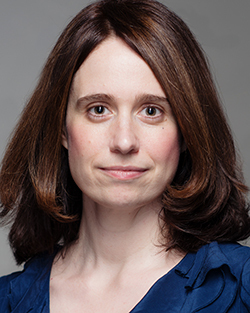 While I expected my conversation with Dr. Kubin to end with her telling me that her staff felt a sense of accomplishment or relief that they successfully performed this critical test, she didn’t. For her staff, aside from the convoy of news trucks in their parking lot, this was all in a day’s work. 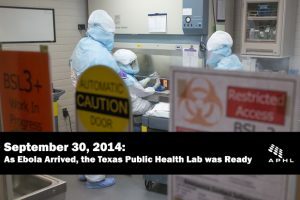 The Texas state public health lab acted quickly and efficiently, just as expected. Had the specimen been sent to any of the other approved LRN laboratories, we trust they would’ve done the same. They are strong, dedicated members of the public health system in this country. Because we have such a system in place, health officials and experts remain confident that this single Ebola case will not spiral into an outbreak. When news of Ebola in Texas disappears, you’ll know the public health system did its job. At the 2015 Laboratory Response Network (LRN) National Meeting in Atlanta, members gathered to learn from each other, solve problems, and finally put a face to the disembodied voices they’ve heard over hours of conference calls. The LRN is a system of state and local public health laboratories, sentinel clinical laboratories, federal facilities such as the Centers for Disease Control and Prevention (CDC), international laboratories, and partners from the intelligence, military and first responder communities. Members train together, share common procedures and standards, and maintain a strong communication network to promote rapid detection and response. Thanks to strong relationships across these varied groups, the LRN is able to respond quickly and comprehensively to a wide variety of deliberate and naturally occurring threats, from the 2013 ricin letters to singular cases of endemic anthrax in Minnesota. 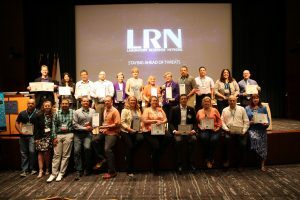 The LRN National Meeting is an essential part of building these strong relationships. While members are in frequent contact with each other throughout the year, allowing face-to-face contact and collaboration with members from across the network offers a level of relationship building that can’t be achieved with an e-mail. Sessions often reflect lessons learned from recent biological and chemical threats. This year was no exception, with several big-picture discussions of the 2014 Ebola Virus outbreak and a presentation on chemical weapons security from Dr. Hugh Gregg, head of the Organisation for the Prohibition of Chemical Weapons Laboratory. Practical sessions included topics like data security, training strategies, need for standards for field screening devices, and radiological preparedness. Attendees were also treated to video addresses by Dr. David Nabarro, special representative to the United Nations Secretary-General, and Dr. Tom Frieden, director of the CDC. The National Meeting also gives members a chance to honor a few select agencies and individuals who have gone above and beyond the already demanding work of the LRN. Ebola response featured heavily among the winners: the Dallas County Health and Human Services Laboratory and the Texas Department of State Health Services Laboratory Services Section each received awards for Excellence in Public Health Response for the 2014 Ebola Outbreak, and the US Army Medical Research Institute of Infectious Diseases (USAMRIID) was honored with the Excellence in Partnership award for their work in developing assays to respond to and rule out Ebola in the US. Partnership continued to be emphasized with the other awards presented. The Indiana State Department of Health State Health Laboratories was recognized with the Outstanding Sentinel Training Program award for their exemplary outreach to sentinel clinical laboratories which paid off when the lab identified the first US case of Middle East Respiratory System Coronavirus (MERS-CoV). The West Virginia Department of Health and Human Resources Office of Laboratory Services was also honored for their partnership efforts in the wake of the Elk River chemical spill in 2014, winning the award for Outstanding Outreach to Poison Control Centers or Hospitals. Finally, the Minnesota Department of Health Public Health Laboratory received the Innovative Collaborations with First Responder Communities award for their well-known and wide reaching program of training, exercises, and networking with first responder agencies throughout the state of Minnesota. In the individual awards, Maureen Sullivan of the Minnesota Department of Health was recognized with the Excellence in Leadership honor for her long-standingefforts to shape public health emergency preparedness programs and policy in her home state and at the national level, and her irreplaceable contributions to first responder and clinical outreach programs in Minnesota. The second and final individual honor, the award for Excellence in Public Service, was presented to Dr. Mary Ritchie, bioterrorism laboratory program advisor for the Florida Bureau of Public Health Laboratories. Dr. Ritchie has almost singlehandedly established and maintained an interagency laboratory workgroup for Florida, bringing together laboratories across Florida to communicate and share critical information. The awards have a lighter side too, with winners selected at each meeting for the LRN Video and Photo Contest. Contestants submit their own original photos and videos, trying to capture what it means to be an LRN member on film. 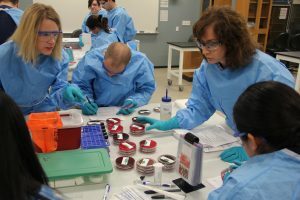 This year’s Best Photo Award winner was the State Hygienic Laboratory at the University of Iowa for their photo of laboratorians hard at work at their Annual Sentinel Laboratory Training Wet Workshop in 2015. Finally, attendees were treated to a world-premiere showing of the Best Video Award winner, a pro wrestling-esque, Lego-inspired depiction of the Texas response to the 2014 Ebola outbreak submitted by the San Antonio Metro Health District Laboratory. LRN Smack Down: Mr. Inactivator vs Ebola Virus (LRN *Best Video Award* winner) from APHL on Vimeo. APHL congratulates all of this year’s winners! Our curiosity and fears have been running wild since the 2014 Ebola* outbreak in West Africa hit headlines. Scenes from Outbreak, the 1995 box office hit that focused on a fictional outbreak of an Ebola-like virus in Zaire, begin running through our minds. We need to stray from these dramatizations and focus on the facts. Movies are supposed to build suspense and fear, but real life outbreaks don’t happen like they do in the movies. This isn’t Hollywood. The most common question on the minds of people around the United States: Are we fighting Ebola well enough to keep it from coming to my community? 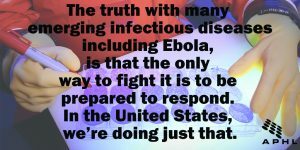 The truth with many emerging infectious diseases including Ebola, is that the only way to fight it is to be prepared to respond. In the United States, we’re doing just that. Although the Ebola-Zaire virus circulating in West Africa has not arrived in the United States, a massive effort is underway to detect and control any isolated cases of the disease should they occur in this country. The Centers for Disease Control and Prevention (CDC), the United States Department of Defense (DoD), pharmaceutical companies, public health laboratories and many more are all working domestically and abroad to minimize the potential threat. The DoD has long been studying Ebola virus and successfully developed a test to detect the Zaire strain. On August 5, 2014, the DoD Ebola detection test received emergency use authorization (EUA) by the Food and Drug Administration (FDA) to be used in this extreme circumstance. (An EUA expedites the FDA approval process for unapproved medical devices that could benefit response efforts when no adequate alternatives exist.) After the EUA was issued, CDC worked quickly to deploy the test to select public health laboratories across the United States. As the supply of test kits increases, CDC will look to expand the number of laboratories qualified to detect the Ebola-Zaire virus. 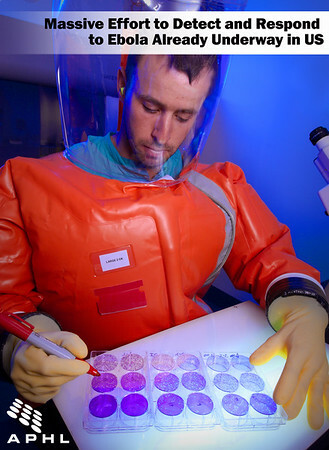 The public health laboratories receiving the Ebola detection assay are part of the Laboratory Response Network (LRN), a specialized network of laboratories that are capable of responding to biological, chemical, radiological and other emerging threats. This preparedness and response effort is not unique to Ebola. Most recently, the LRN has been leveraged to respond to emerging infectious diseases like Middle East Respiratory Syndrome – Coronavirus. 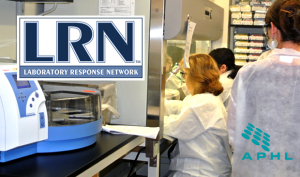 The LRN provides a strong infrastructure of trained personnel, clear communication lines, and advanced technology to launch an effective response to emerging infectious disease. While we all are concerned for the health and safety of the people in the most affected nations, we can find some comfort in knowing that a coordinated effort of qualified scientists, doctors, public health officials and organizations is underway to minimize the threat of outbreak in the US. *Did you know there are five known strains of Ebola virus? The most dangerous one, Ebola-Zaire, is responsible for the outbreak in West Africa. The virus spreads person to person through direct contact with blood and other bodily fluids; despite what you may have read in fear-mongering articles, the spread of the virus through the air has never been documented. Once inside the host, the virus works by weakening the immune system and starving the host organs to the point of failure. Planning. 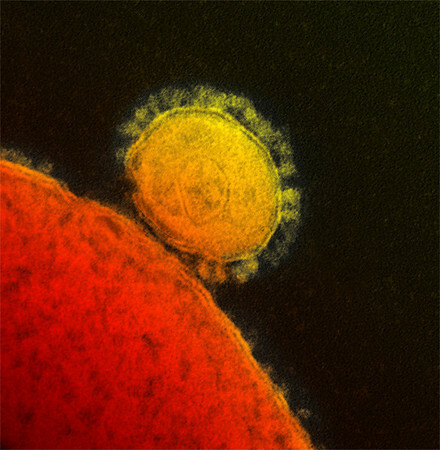 MERS-CoV was first reported in 2012 in Saudi Arabia. Once transmission became sustained in the Middle East, public health officials knew it was likely that a case would arrive in the US: we just didn’t know when. We had time to plan our response. An approved test. CDC rapidly developed a real-time reverse transcriptase polymerase chain reaction (rRT-PCR) test which was granted emergency use authorization (EUA) by the FDA on June 5, 2013, and deployed the same month to 44 state public health laboratories and one local public health laboratory. Infrastructure. The Laboratory Response Network (LRN) provided critical infrastructure for rapid distribution of the MERS-CoV test to public health laboratories across the US. Training. Once laboratories received the test, they trained their staff and completed proficiency testing to demonstrate that they were trained and ready to perform testing should the need arise. Experience. With health departments and physicians on alert, over 150 patients with MERS associated symptoms have been tested using the CDC assay. All were found to be negative. This testing provided valuable opportunities for laboratories to familiarize themselves with the test. Communication. CDC, APHL and other partner organizations have maintained timely communications with states, and others partners to keep everyone abreast of the current situation. Dedication. Our public health labs are full of amazing scientists who are willing to spend countless hours, seven days a week to ensure rapid test results. So if we aren’t panicking now that we have MERS-CoV cases in the US, what are we doing? We’re sprinting to keep pace with MERS-CoV and so far we have performed well, managing every step in the process with precision. Indiana promptly notified CDC of a presumptive positive MERS-CoV infection and CDC rapidly confirmed this result. CDC and Indiana started epidemiologic investigations and tested samples from close contacts of the infected patient. APHL and CDC began communications immediately after the first case was confirmed. APHL, in collaboration with CDC, held a laboratory alert call on May 6, 2014, to provide state and local public health labs with a situational update and to review laboratory testing guidance. Currently CDC is distributing new proficiency testing panels so labs can refresh their competency on the CDC MERS-CoV test. MERS-CoV is a serious threat that deserves the highest level of preparedness and attention. Fortunately for the American public, we in the public health system are poised to handle MERS-CoV and other health threats whenever, wherever and however they enter our country. This is why we aren’t panicking, but it’s also why public health requires steady support. Pathogens have no regard for budgets, funding cycles or economic trends. They won’t wait, and neither can we.